Coyote Blog » Blog Archive » Gas Prices a Crisis?? The media is just longing to make current gas prices into a crisis. And you can already see them gearing up to bash oil companies for "record" profits (by the way, when reading the profit announcements, pay attention not to just total dollars but to profit margins, then read this). Glenn Reynolds links this gas price chart this morning at Random Useless Data, showing that in real terms, gas prices are still below their peaks, and not at "all-time highs." By the way, just so you know my personal incentives, there are very few people out there who run a business whose fortunes are more sensitive to gas prices than my recreation business. This will not be a very good summer for me, but if we leave the market alone to do its work, things will likely be better in 2007. Intervention by Congress will pretty much assure that things will get worse. A question: would the price/100miles number have to factor in the theoretical price change in the more efficient vehicle? An example: Over ten year the real price of gas stays flat. The MPG of the average vehicle goes up, so the price/100miles goes down. However, the price of cars goes up as well. Would that not mean the price/100miles actually stays even? Now, I know this would be hard to do, and it could actually go in either direction; but might it make your number less valid? There is no such thing as an "inflation-adjusted price;" it's an oxymoron. Only incomes can be adjusted for inflation, not prices. Input prices can, however, be adjusted for income growth (i.e., the reciprocal of the previous sentence). This yields much the same result (since income growth tends to track inflation), but without the conceptual error of discussing "an inflation-adjusted component of inflation." This is probably even more impressive if you account for the impact of taxes (fixed $/gallon taxes have risen over time; sales taxes levied as a % of price exacerbate increases). 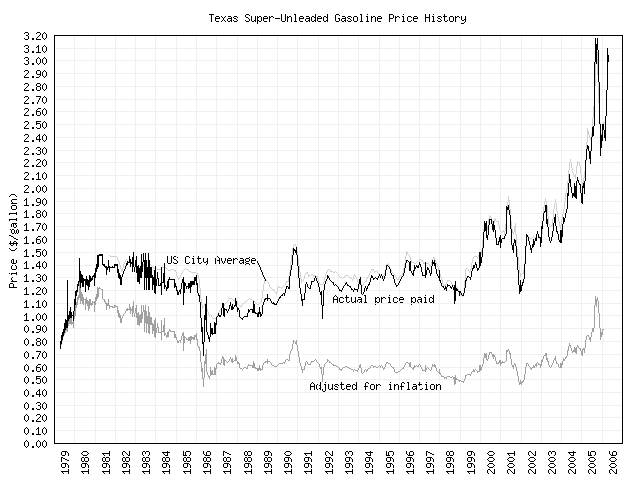 A second factor is that gasoline quality has consistently gotten higher over time - i.e., more expensive to produce. Various easy ways of getting octane have been regulated out of existence (increasingly restrictive limits on RVP, MTBE, tetraethyl lead, etc.) but innovation has kept the cost per octane number constant around $0.01/gallon. Restrictions on sulfur content have required huge capital investments (e.g., "Tier II" capex) that theoretically should have been passed on to consumers as higher real prices. If we split the gas price out by crude/tax/refining/marketing margin I suspect the crude price and marketing margin would have fallen quite a bit, refining would be flat to positive. Note that 1979 is probably not a representative year to start this graph as it was part of a short price spike that was not topped until around 2000. If energy prices were included in the deflator used to get the nominal gasoline price series back to real prices in this graph there could be a feedback loop that understates the price increase over time. Compliments on a very nice plot. Is it possible to incorporate another "correction", this time allowing for average annual miles driven per head of population? How come no one cares how much they spend on the car itself. If you depreceate a car at .48 cents a mile and you get 24 mpg, then the cost of your gas is .13 cents a mile. The vast majority of the cost of driving is not really related to petrol. But evil oil companies, profiteering, etc, etc, make much better press. Actually, adjusting for inflation is not an accurate way of looking at this whole thing. For example, in 1986 the average hourly wage was 8.92 and a gallon of gas averaged .90 per gallon. That means that for an hour's work you could buy 9.9 gallons of gas. In 2006 the average hourly wage is sitting at 16.51 per hour and a gallon of gas is around 3.00 per gallon. That means the average working stiff can buy about 5.5 gallons of gas for an hour's work. Adjusted for inflation or not it's not good and compared to 20 years ago, the price of gas is WAY out of line. Daniel, where are you getting these figures? I'm just curious cause if that was hourly wage in 1986 (where gas prices were reaching a low point), I'd like to see what it was for 1980, when they were towards their highest. Guys? Inflation IS NOT *the result* of rising prices -- that's exactly backwards, because prices are not what is "inflating". What is inflating is the supply of fiat currency. Should the supply of currency balloon, the price of commodities with rapid production-to-consumption cycles will adjust the most quickly. In the charts below, you can see gasoline price changes over the last few years in response to (A) a genuine shortage in response to hurricanes damaging hundreds of rigs in the Gulf of Mexico (note price quicking falling as quickly after the supply bottleneck has passed as it rose before), and (B) a ballooning supply of fiat currency as measured against an object value of gold (which has, relative to the dollar, skyrocketed 100% in less than five years, with half of that coming in the last one year). Note that the Fed has stopped tracking "M3" money-supply -- which is code for "we no longer give a damn how much of this green funny money is in circulation!". Secondary spike in gasoline prices correlating with dollar hyperinflation over the last year as measured vs gold in the previous link.